A 2018 iPad Pro and a second-gen Apple Pencil. 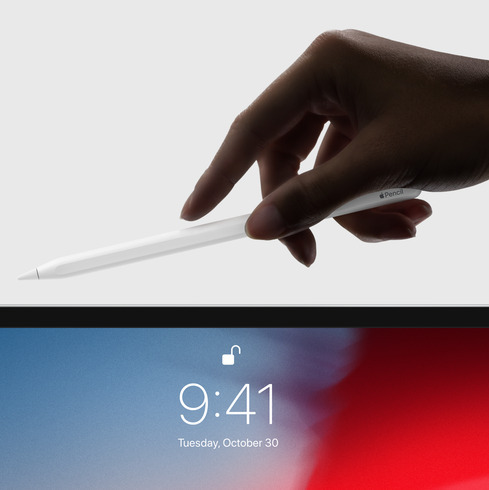 The "inductive charging data port" for connecting a second-generation Pencil is "expensive enough to be prohibitive for the new Air and Mini," Daring Fireball's John Gruber said. While only indicating he was "reliably informed" on the matter, Gruber is known to have deep industry contacts. The second-generation Pencil has a few advantages over the first, but the main one is typically considered the ability to magnetically attach to a 2018 iPad Pro, solving both charging and storage. It's not compatible with any other iPad. Beyond inductive technology, the updated Air and mini would have also had to be redesigned with flat magnetic edges. Alternately, Apple could have added a Lightning port to the newer Pencil, but that would have left the problem of having a removable cap that's easily lost. The latest iPads are largely performance upgrades with few major changes. Enhancements include a 10.5-inch display on the Air, A12 processors, True Tone displays, up to 256 gigabytes of storage, and first-gen Apple Pencil support.